It has been 3 weeks since the 2015 Deuces Wild Triathlon Festival took place in the thin air, cool temps (it was 20-25 degrees cooler than the 105 in Tucson) and pine trees of Show Low, Arizona which sits at 6500 feet elevation. I planned to write this race report long ago but got busy with training which included logging 960 miles on my bike over the 3 weeks after the race. I have also been taking time off from running to allow the complete healing of the tendonitis in my knee that I have been battling with this season. So here it is, my race report. First off it was fantastic news that the race was back under the direction of TriSports Racing. The last two years had seen a drastic decline in the quality of the race. But with the race back to its old ownership I had great expectations that the race would be back to its old high standards. TriSports Racing and new race director Carolyn Audilet did not disappoint. The festival includes 3 races over the weekend. 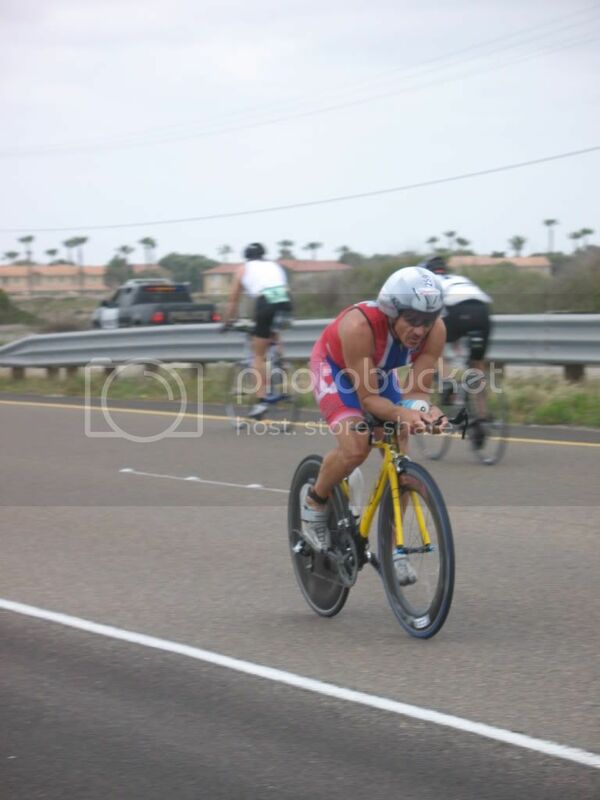 On Saturday the schedule included the Dueceman 1/2 ironman distance and the Dueces Wild olympic distance races. And those are followed up on Sunday by th Dueces Wild xterra race. Initially I had signed up for the 1/2 but with the lack of running i was able to do leading into the race I switched to the olympic. The change of races was an easy affair with a simple email to the race organizers. My weekend started on Friday. I made the 4 hour drive from Tucson to Show Low. Upon arriving I checked in to my pre-reserved campsite and set up camp. One of the thing I love about this race is camping at the lake (hotels are also available close by). The Fools Hollow Lake campground is a very nice camp area on the lake and only about 1 mile from the start/finish area. After camp setup I went down to the race venue and picked up my race packet. The local high school kids cooked up a convenient pasta dinner at the venue. I then returned to my camp and relaxed the rest of the evening before crawling into my sleeping bag for an early night. Saturday morning I awoke 15 minutes before my alarm was set to go off. No problem, a little extra time to eat and prep. After a bagel and banana for breakfast, I got dressed and visited the campground restroom. I then jumped on my bike and made the mile downhill ride to the race venue. I set up my transition area, picked up my timing chip and got body marked by the great volunteers. I then had lots of time to relax, talk to old and new friends and then watch the start of the 1/2 ironman race. As my start time grew near I downed an energy gel and then got in to my wetsuit. With about 20 minutes left before my start I got into the 64 degree water for a little warm up. The national anthem and a few last minute race instructions were given and then it was go time. 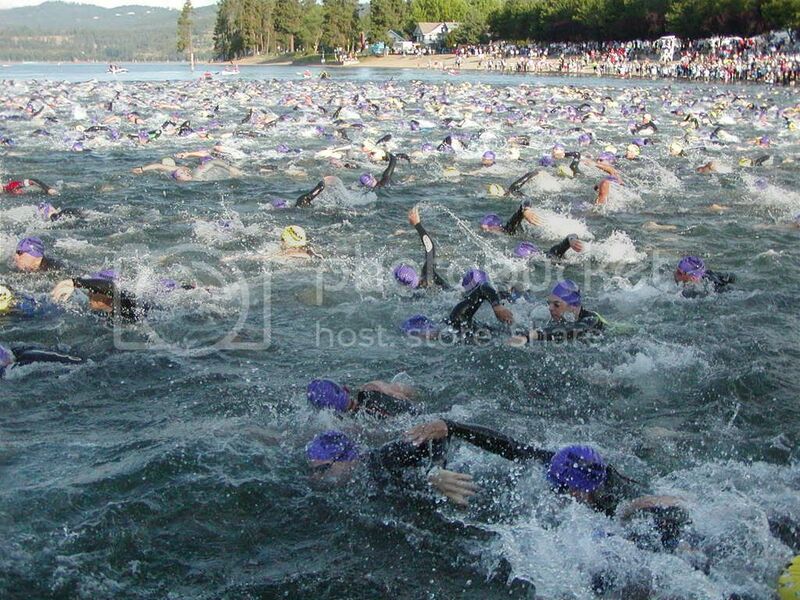 The 1500 meter swim starts and finishes in a small cove and is a counter clockwise single loop. I lined up in the front row on the far left side. This made for a fairly straight line swim out of the cove and to the first buoy. The horn sounded and we were off. My line had a little bit of a crowd but I managed to avoid most contact and was able to quickly get into my stride. My strategy worked well and put me in a good position going to the first turn. My lungs were feeling the altitude. I made the first turn, settled in and was feeling good. I stayed on course down the long back stretch and made the next turn. I was able to jump on the feet of a couple of guys on the way back in until I noticed they were taking a less direct line. I corrected my line and although they were faster swimmers I exited the water just behind them. I ran up the boat ramp, bypassing the wetsuit strippers, into T1. In T1 i quickly removed my wetsuit, goggles and swim cap. I put on my helmet, grabbed my bike and ran to the mount line. 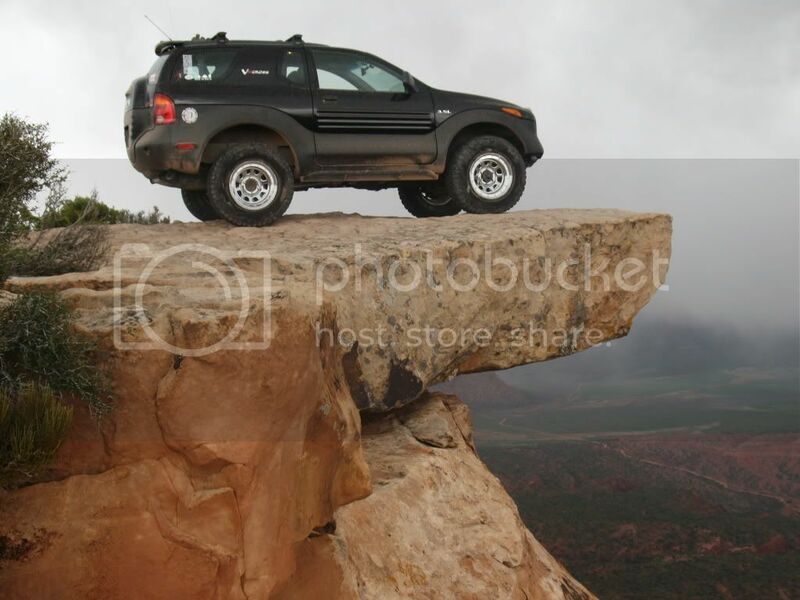 Once on my bike i slipped my shoes on and quickly got up to speed. The 40k bike route is a single loop consisting of rolling hills and a 2-3 mile climb back into town before entering back into the lake area. My legs felt strong during the ride dispite the altitude. The temperature began to climb into the low 80s by the end of the bike. I made up a few places on the bike. I got out of my shoes as I approached the bike finish. At the dismount line I hit the ground running. I had to double back quickly when one of my shoes decided to pop off my pedal. Bike time 1:02:15 (official). The 6th fastest bike split of the day. Entering T2 I found my spot, racked my bike, took off the helmet, put on my socks and shoes, grabbed everything else and hit the run course. Once on the run I put on my hat, sunglasses and race belt/number. The 10k run is a “C” shaped single loop with an out and back section in the middle. The run takes you on a dirt path along the lake and through the campgrounds with a few hills along the way. I started off with 7:08 mile, mile 2 I settled into a 7:37 pace then dropped 7:29 3rd mile. A slightly uphill 7:39 4th mile was followed up with a 6:56 slightly downhill 5th mile. The 6th mile throws a nice little hill at you just before the finish area. I went through the 6th mile in 7:36. And then kicked it up a bit for the finish. I crossed the finish line in 2:15:26. 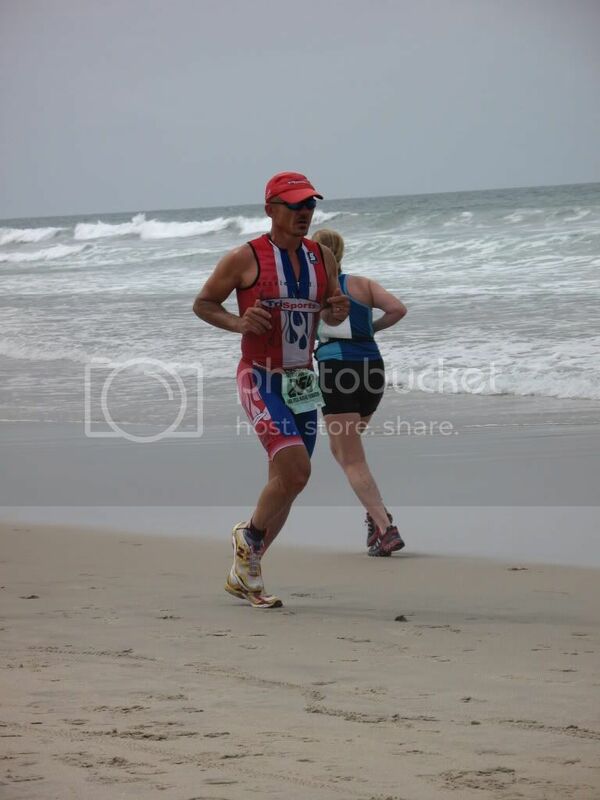 7th overall (6th amateur) and 1st in the 50-54 agegroup. At the finish line finishers were greeted by volunteers with popsicles! Plenty of other post race food was also available. After a little time cooling down, including a dip in the lake and packing up my gear in transition I ventured over to get my post race meal that was included with the race. A teriyaki chicken rice bowl that hit the spot. The awards were held at the race site and included a raffle that benefits local charities. My luck was good as I won a cycling video and a Torhans aero drink system. Th award were nice and doubled as a holder for the finishers medal. After returning to camp and cleaning up I had the pleasure of enjoying a nice mexican food dinner with the race crew and my sponsors from TriSports.com. After a good nights sleep in my tent I awoke early on Sunday. I ate breakfast and packed up my camp. I again headed down to the race venue (by car this time) for my turn on the other side, working the bike aid station for the xterra triathlon. Had lots of fun cheering on the off road athletes and helping to keep them hydrated. After packing up the aid station we headed back to the finish area and were given another nice lunch for volunteering. Afterwards it was time to head back down to the heat of the desert. From 80s in the pines to 105 in the desert. This entry was posted on June 21, 2015 by Billy O. It was filed under Uncategorized .